A few weeks ago I spent the better part of three days intermingling with some seriously awesome minds in marketing and technology at the Digital Pharma West Conference in San Francisco. One thoughtful marketer, a recent transplant from outside Pharma, said something that made me think. The guy was on the mark, and he wasn’t even an industry insider. How did he know that everybody in Pharma still thinks of marketing and sales as separate entities? Like oil and vinegar? Like church and state? These days, nearly all content is deployed digitally and should be tailored to engage HCPs, patients, and caregivers on their own terms. Look at the journalism-style YouTube videos on Teva’s Life Effects website, in which Kati Morton speaks frankly about living with depression. Or Irritabelle! You can still find her in long and short-form spots, a goofy and amusing reminder that IBS-D sufferers can find relief. Pharmaceutical sales reps need to think about how to carry on the multi-channel conversation. How to integrate across platforms? How to transmit powerful content to a specific audience? We are well past the age of dropping off vis-aid pamphlets or branded notepads. A recent study conducted by e-Pharma Physicians found that doctors received redundant information from sales reps a whopping 51% of the time. Are you kidding me? Physicians and nurses aren’t getting their brand enlightenment from a silly mug. Wake up, sales reps. Welcome to the world of digital adaptation! Oh, calm down. No need to cry in your shoes. Digital marketing strategy doesn’t differ that much from traditional sales tactics. Three main elements are still the same. Probably more, actually. But here are three key issues that will never change. Pharma must continue forming deep connections with key players. I’m talking about patients, caregivers, health care professionals, and industry leaders. Nothing replaces a deep, human connection. It’s what makes us humans. Here’s an example. Remember the Take it From a Fish campaign back in 2015? It was hilarious. Two dead fish on ice talked to each other about lowering triglyceride levels through healthy eating. The campaign was non-branded undertaking, but it bled into Pinterest recipes revealing heart-healthy meals and a big following for AstraZeneca on Twitter. How come? Well, the campaign deepened our connections to each other. It created a space for patients to connect with a medication eventually, but more importantly, it connected wives to husbands. What would the wives feed their husbands now that cholesterol was an issue? HCPs jobs got easier, too, now that a conversation had ignited about an asymptomatic condition. A soft sell? Possibly. But reps leveraged what they knew about middle-aged guys with cholesterol problems, and the whole campaign turned out to be, as they say in common fishing parlance, a honey hole. Guess what, folks. We still need to put out amazing content if we want to connect with people. Let’s go back to the fish example. I love an aquatic creature that talks. How did those anthropomorphized fish succeed in connecting with so many people? Well, the idea was well-executed. There was a story, something for people to hook into (sorry), something to keep them engaged. Good story is good content. Here’s another example of awesome content. 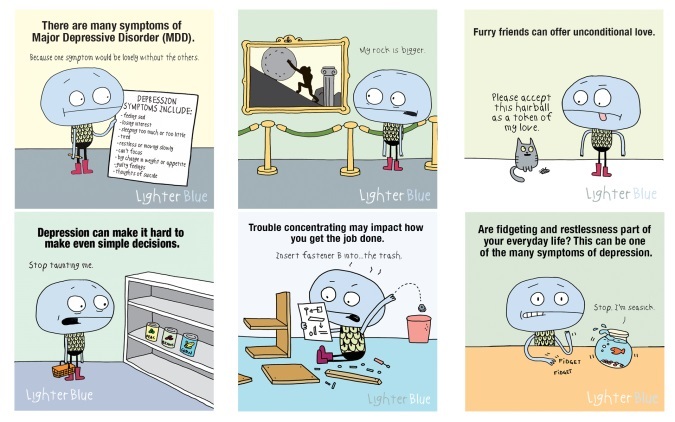 Last year’s award-winning patron saint of depression, a cartoon figure called Blue, garnered 1.3 million Facebook shares and thousands of posted comments. Talk about connecting deeply with a particular demographic – Blue gave millions of people struggling with depression a window into their collective experience, bringing some well-deserved levity to a condition that is, well, depressing. Kudos to Takeda/Lundbeck for introducing an amusing comic strip to draw attention to their brand. Great content! Let’s keep it alive. If you’ve got someone’s trust, you have a relationship for life. It’s that simple. Take the medical device company, Dexcom, for example. 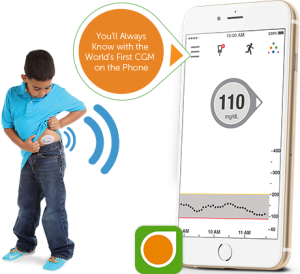 The team at Dexcom designed a sensor that could measure and monitor a child’s glucose levels subcutaneously and then transmit the information to her anxious mother on a mobile phone. In this case, the ingenuity of the product drove the brand, but it was the images of relieved parents monitoring their kids’ glucose levels while they were at school that lit up Facebook and Twitter feeds. Now there’s a brand that solved a huge problem for parents. With a simple ding, a mom or dad could be made aware of dangerously low glucose levels (which can lead to coma) while their kid sleeps or is on a field trip. Dexcom totally came through. Worry not, sales reps. The architecture of trust is still built brick by brick. But, trust doesn’t always require an in-the-room experience with a physician. They don’t have time for those long lunches anymore. Now, more than ever, physicians want access to information. Physicians access 85% of their information via websites and mobile applications these days. That’s huge! Let’s build brand trust by providing what’s needed. Let’s send out short, digestible videos in an email rather than antiquated charts and printed pages. Let’s design user-friendly HCP portals with specific patient requirements in mind. Provide the relevant, needed information in an easy-to-use format, and you’ll be amazed at how brand trust will grow. And you didn’t have to be in the room wasting precious time, either. Look, it’s not the medium that is hard to convey, it’s the message embedded within it. Find the pain. Provide value. If you don’t, you’re just another internet polluter throwing pieces of detritus into the air and hoping something lands. That’s not digital strategy. That’s online littering. Look around. The internet is wallpapered with it. Here’s the thing. In this day of rapidly evolving technologies, we are all digital sales representatives. Consumers want to feel heard, entertained, educated. They want value, and they want to connect with a larger group of people who share a similar problem. Marketers in Pharma have barely begun utilizing the ways that multichannel messages help connect people. To be sure, the medium has changed and continues to evolve, but meaningful connection, listening carefully, adapting and modifying content as a pathway to building trust, well — those things will never change. Like this? Read another one here. Or here. We love this one, too.